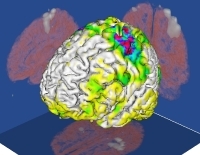 In this project, we carry out research in the visualization of brain connectivity information, covering both fundamental methodology and application studies. Diffusion tensor imaging (DTI) is an MR imaging technique that allows in vivo exploration of human tissues. Some specific areas of interest are joint visualization of DTI, interactive visualization and simulation tools for revealing anatomical and functional networks, and carrying out application studies. One of the main applications is tinnitus, which is defined as the perception of sounds in the absence of anexternal sound source. Using a probabilistic DTI approach we determine the location of human auditory pathways and we look for connectivity changes induced by the presence of tinnitus.